What better way to celebrate all of the New Year’s resolutions that are not going to be kept this year than a question about things that failed in 2015. So this week’s question is: which anime, or really anything media related to Japan, was the most disappointing to you in 2015? For me the answer is definitely Garo: Guren no Tsuki (The Crimson Moon). 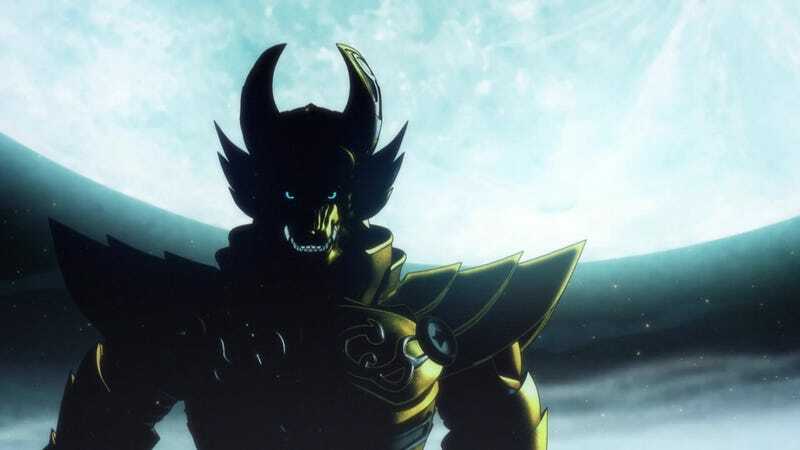 I loved the first Garo, it had great animation, I know some people disliked the CG next to the 2D animation, but I quite liked the juxtaposition. It also had a good story with solid characters that you cared about. So when Crimson Moon was announced I was pretty excited to see what MAPPA could do, as the studio had manage to garner quite the goodwill with me between the first Garo, Ushio to Tora and Rage of Bahamut: Genesis. Needless to say, I was met with disappointment. I have only watched the first five episodes and I have no idea when I will bother to get back to it. Not only do I not find the characters or story that interesting, the animation is not nearly to the level of the first Garo. For all the fluidity and movement I had come to expect, the combat in Crimson Moon was static, ridged and uninspiring. Simply disappointing. AniTAY Question of the Week: Are You Not Entertained?